Sir Humphrey Gilbert was born in 1539 near Dartmouth as the second son to Otho and Katherine Champernowne Gilbert. He had two brothers Sir John Gilbert and Adrian Gilbert and two half-brothers, Carew and Sir Walter Raleigh. He had received his education at Edon and the University of Oxford. He is known to have served in France in 1560’s and in 1566, he went to Ireland as a part of rebellion group. In 1570, he was awarded knighthood. In 1569, Gilbert had returned to Ireland and after the death of O’Neill, he was made the Governor of Ulster. In the same year, he had made a proposal for establishing a presidency and a council. The actions of Gilbert in southern Ireland had influenced the first Desmond rebels. In 1566, he had played a vital role in convincing the Queen to use the Northwest passage for trading purposes. In 1570 after he came back to England, Sir Humphrey married Anne Aucher. In 1571, he was elected to parliament to represent Plymouth. In 1573, he had presented Queen Elizabeth I with a proposal for a University in London. Sir Humphrey also played a role in setting up the Society of the New Art. In 1578, Sir Gilbert was given the charter to go on an expedition to find North America. This voyage could not be carried as bad weather forced them back to England. It was 1583 that Gilbert set sailing and was successful in establishing a a small settlement on this newly explored land. It was the first English colony in America. In 1584, Sir Humphrey’s brother Adrian had gotten the sanction to search the Northwest Passage. 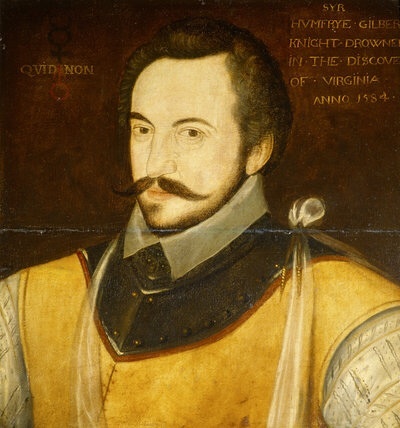 In 1579, Sir Humphrey and his half-brother Sir Walter Raleigh were asked by William Drury, Lord Deputy of Ireland to attack James Fitzmaurice Fitzgerald and also to stop a Spanish ship that was expected to arrive. Sir Gilbert had three ships of his own, Anne Aucher, a 250 ton ship, the Relief and the Squirrel which weighted 10 tons. In 1579, Sir Gilbert had left for his expedition but was soon lost in fog and heavy rain near Land’s End. This episode had made the Queen uncertain about Sir Gilbert abilities at sea. After reaching his destination, Sir Gilbert was trapped in disputes with the local people. In 1581 Gilbert was the member parliament for Kent and was expected to be appoinetd as the President of Munster after the removal of Ormond. However, he wanted to eatablish a English colony in North America in the name of the Crown. It was in 1583 after some issues that Gilbert finally set out on his mission. He had taken around five ships on this voyage but, his ship, the Bark Raleigh had to return owing to some problems. Sir Gilbert’s crew which comprised of misfits, criminals and pirates had been successful in reaching the newly explored land. Sir Humphery Gilbert is believed to have died in 1583 during this voyage.